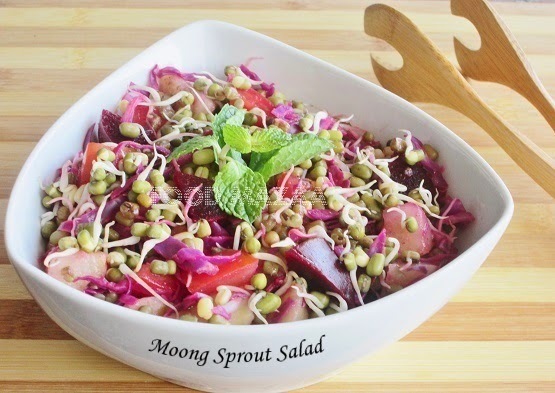 A very healthy bowl of salad specially in summers when you want to eat light food. 1.Soak the moong beans for few hours. 2.Wrap them in a wet muslin cloth and hang it or just place it on a plate and leave it in airy place or window sill. 3.Keep sprinkling water a few times in a day. 4.In 2-3 days you will see the sprouts growing. 5.If you want longer shoots repeat the process for a couple of days more. 1. I have blanched the sprouts and cabbage for one boil in salted water. You may use them raw if you prefer. 2. Mix the ingredients together when the sprouts and cabbage are cooled. 3. Crush the mint leaves to get the nice flavour and chip them finely. 5. Add the rest of the ingredients and mix well. very healthy and balanced diet recipe...full of nutrition! Very balanced and delicious healthy salad. so colorful, healthy and delicious! Healthy & colorful salad. Thanks for linking. Delicious salad, Looks perfect and colorful.